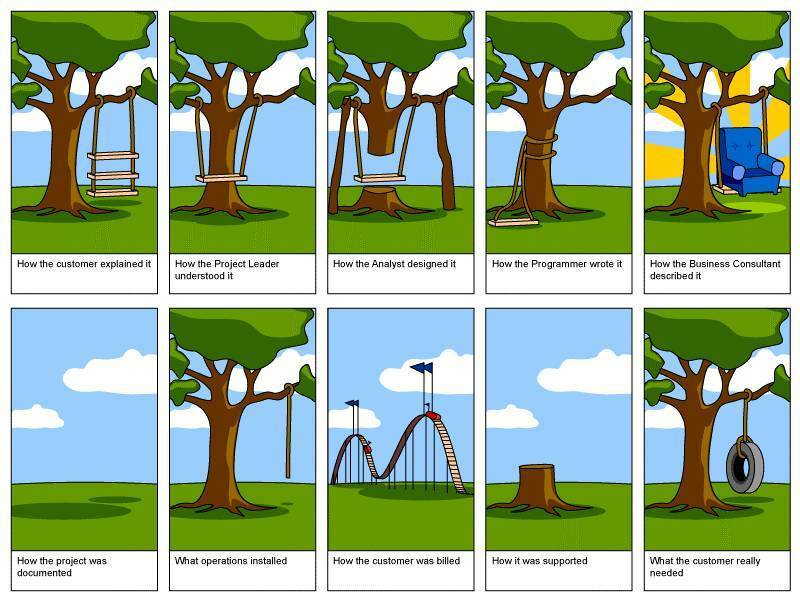 Most of us have seen the following (in)famous tree swing cartoon (or several versions of it here and here) depicting the software development process. I even found a website that lets you add your own captions to it! A lot of programmers I have met did not think about the contextual needs of the end users while writing code. It was all about getting the requirements coded and shipped to the client. There was no concept of giving some thought to the end user who possibly might be a 65 year old truck driver who hates his job and hates using his on-board touchscreen job despatch system for 14 hours a day. Client: I need a calculator. Programmer: What do you want it to do? Client: Add, subtract, multiply, divide. Programmer: Here’s the fastest calculator in the world that can add, subtract, multiple, divide and you can save your calculations in the Cloud! UX Designer: Who is the calculator for? Client: For blind kids who don’t understand English. UX Designer: What are they going to use it for? Client: To learn to add, subtract, multiple and divide in their native language. UX Designer: Do they have fingers? Client: Only some of them. What are they are trying to achieve? What is their ultimate motivation in using your software? I’m not sure how much thought Microsoft put into their end users when they developed Windows Mobile (a screenshot below to refresh your memory) and tried to squeeze their desktop operating system into a tiny phone. They ended up paying for it by losing a lot of their customers, sick of carrying their tiny stylii around, to Apple’s iPhone and Google’s Android which had much superior user experiences. It is very sad to see so many great software products not making it just because the UX of the product was neglected. Investing in UX design is like a long-term financial investment. It is a proactive process that might not give you immediate financial returns but will definitely earn the respect of your users from Day 1. A sustained number of happy users means better financial ROI. But a household that’s struggling to pay the bills would seldom think about investing. They would rather want to pay their water bills today so that their water supply doesn’t get cut off tomorrow. Unfortunately, a lot of software houses are also caught in this vicious cycle and are too busy fixing last-minute critical bugs, putting out fires and resolving crises that UX design is the last thing in their minds. If you want to create a successful software product, you MUST connect with your users and see what they see and feel what they feel. Efficiency alone does not cut it anymore, nor does a long list of features or superior hardware. It’s a combination of all those plus a good understanding of your user’s needs in the context they are in that makes great usable software that is both efficient and effective – and therefore satisfying. This entry was posted in Uncategorized by Nirish Shakya. Bookmark the permalink.